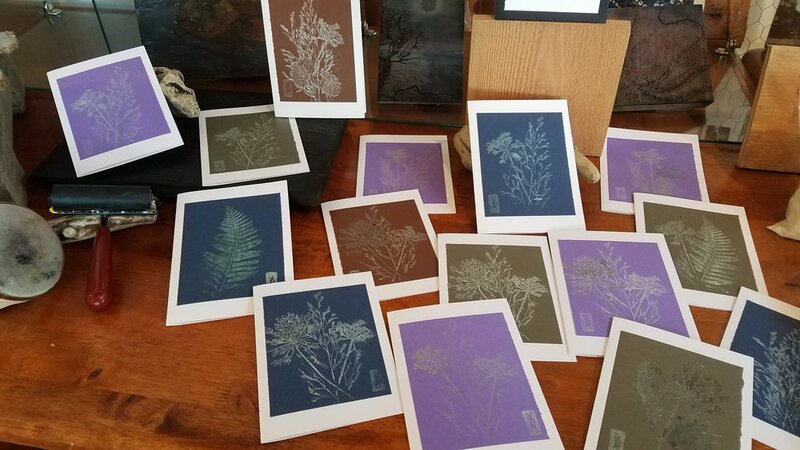 Watch as Karen Britt creates Botanical Monoprints in the gallery/studio. Each print is hand inked and arranged with natural, organic flora then hand pressed into a one-of-a-kind print. Some of the prints undergo multiple registrations and treatments with other printmaking techniques like encaustic collograph. The prints are available mounted, unframed (discounted), and as art cards (which we are always asked about this time of year). See what the new offereings are daily as we sell through stock quickly (especially with the cards).